From the very beginning the population in New Orleans consisted mostly of French convicts and prostitutes who were deported to the new world. 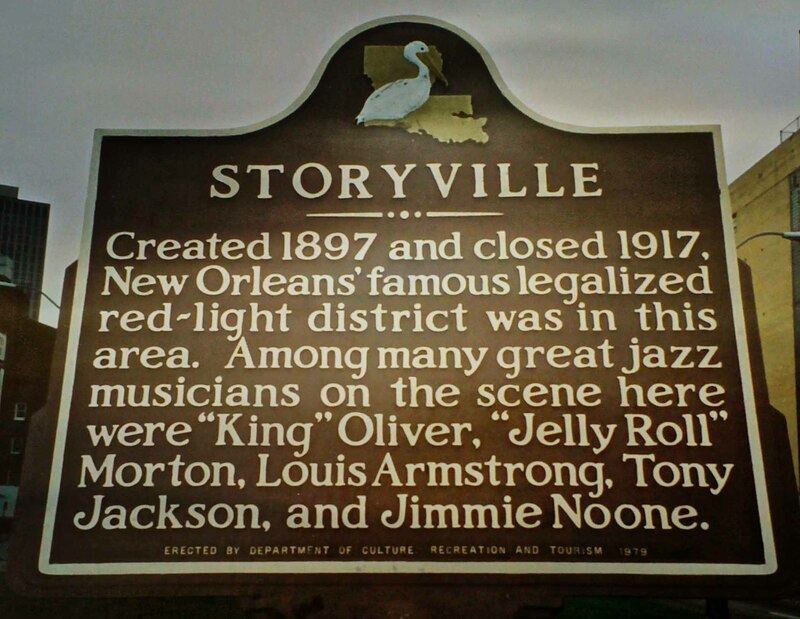 So prostitution was there long before Storyville and attracted customers from all over the South. The Red Light District Storyville got its name after alderman Sidney Story who ironically fought a war against prostitution. It was on his initiative in 1889 the city council decided that an area consisting of 16 blocks, divided by Basin Street, should be the only place in New Orleans with legal prostitution. The idea was to limit the prostitution that had spread like wildfire all over the city and attracted customers from all over the Southern States. 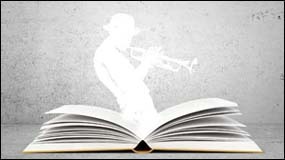 The effect was just the opposite, and in Buddy Bolden’s days about 2,000 prostitutes were working on a daily basis in Storyville. 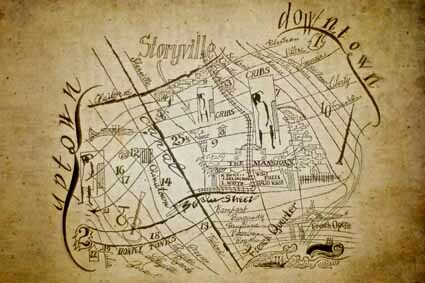 There was also a smaller district Uptown called “Black Storyville” but for the black population only. The railway station was located centrally at Basin Street, and as soon as the passengers got off the train they were greeted by prostitutes waving and cheering. 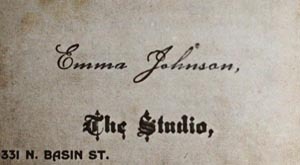 The two most famous and infamous brothels were Lulu White’s Mahogany Hall and Emma Johnson’s Studio. Both places could provide all kind of sexual services, if you had enough money. 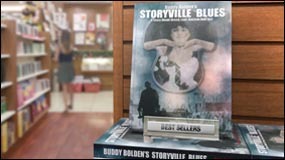 Countless girls have perished in Storyville, where alcohol, drugs and sexually transmitted diseases flourished. 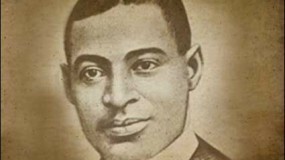 Buddy Bolden played occasionally at the saloon Big 25, and one night with fatal consequences. In 1917 the United States’ Navy closed the district claiming it was bad for the soldiers moral. Big 25 the saloon in Storyville, where Buddy performed during the Robert Charles insurrection. 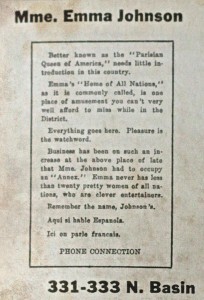 Advertisement in the Blue Book for Emma Johnson’s studio. Probably the worst place in Storyville. Read more about it in the book. 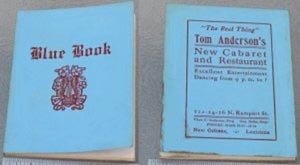 Tom Anderson was behind the infamous Blue Book, where names and addresses of the brothels in Storyville were printed. Fra begyndelsen bestod befolkningen i New Orleans hovedsagligt af franske straffefanger og prostituerede, som var deporterede til den nye verden. Så prostitution eksisterede i byen lang tid før Storyville blev etableret og tiltrak kunder fra hele syden. ”The Red Light District” fik dets navn efter byrådsmedlem Sidney Story, der ironisk nok kæmpede imod prostitution. 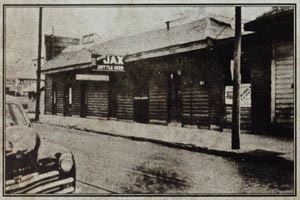 Det var på hans initiativ at byrådet i 1889 besluttede at et område bestående af 16 blokke, delt af Basin Street, i fremtiden skulle være det eneste sted i New Orleans med legal prostitution. Ideen var at begrænse den prostitution, som havde bredt sig som en steppebrand over hele byen og tiltrak kunder fra alle sydstaterne. Effekten var lige det modsatte, og i Buddy Boldens tid arbejdede ca. 2000 prostituerede i byen. 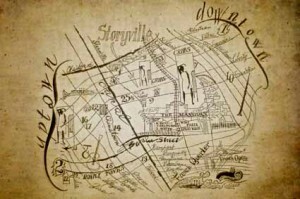 Der var også et mindre område Uptown, der blev kaldt ”Black Storyville”, som var forbeholdt den sorte befolkning. Jernbanestationen var placeret centralt ved Basin Street, og så snart passagerer stod af toget, blev de hilst af vinkende og indladende prostituerede. 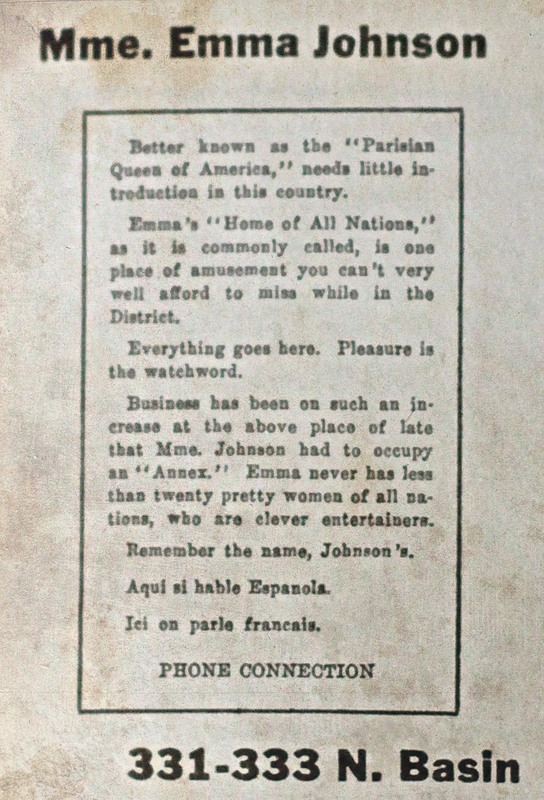 De to mest berømte og berygtede bordeller var Lulu Whites Mahogany Hall og Emma Johnsons Studio. Begge steder kunne man købe alle tænkelige seksuelle ydelser, hvis man havde penge nok. 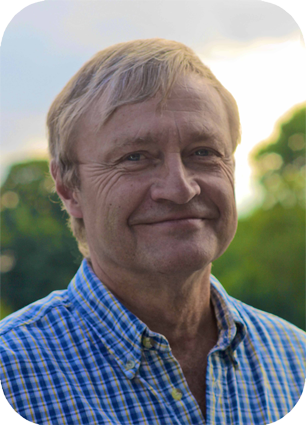 Utallige piger er gået til i Storyville, hvor alkohol, stoffer og seksuelt overførte sygdomme florerede. Buddy Bolden spillede lejlighedsvis på værtshuset ”Big 25” og en nat fik det fatale konsekvenser. I 1917 lukkede USA’s flåde Storyville med henvisning til, at distriktet var skidt for soldaternes moral.